13. The Friggatriskaidekaphobia Treatment Nurse is an R.N. (Rational Notable). 12. The Friggatriskaidekaphobia Treatment Nurse has never lost a patient -- but her patients happily lose their superstitions and irrational fears. 11. Think of all the fun photos you will be able to share with friends and family. 10. Friday-the-Thirteenth rarely occurs during any given year, so you should take advantage of the rare opportunity by hiring the Friggatriskaidekaphobia Treatment Nurse. 9. Challenge rational behavior levels using the Anti-Superstition Obstacle Course. After all, most people are still very superstitious. 8. Your party, event, function, or program will take on an atmosphere of fun. 7. The Friggatriskaidekaphobia Treatment Nurse is a new and hip concept. Introducing new talent and unusual entertainment is always a plus for any event. 6. The Anti-Superstition Obstacle Course will help educate the public about myths and superstitions. 5. The Friggatriskaidekaphobia Treatment Nurse will pose for memento photos with guests and attendees. 4. The Friggatriskaidekaphobia “Clean Bill of Mental Health” will be awarded to all persons who complete the Anti-Superstition Obstacle Course. The certificate will also serve as a memento of the event. 3. The Friggatriskaidekaphobia Treatment Nurse brings her own medical bag (black cat, voodoo dolls, umbrella, anti-horoscope kit, etc.). 2. 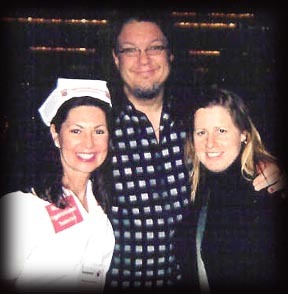 Penn Jillette (of Penn & Teller) highly endorses the efforts of the Friggatriskaidekaphobia Treatment Nurse, saying that the character is a “strong gimmick” to convey critical thinking skills. 1. You can prove to yourself and others that you are not at all superstitious!